LG has claimed that it has sold more than 3 million LTE-compatible smartphones worldwide, and revealed plans to extend the sale of its LTE range to 10 new countries, taking the total to 20. The Korean manufacturer’s devices are currently available in 10 markets — with a particularly focus on Korea and the US — but it is stepping up the sales efforts. A number of as yet undisclosed countries in the Middle East are among those it will begin selling to before the end of the year, LG said in a company announcement translated by the Korea Herald. The company released its first global LTE device in May 2011, when the Revolution came to the US. The Optimus LTE is its most notable success story, becoming its first LTE device to pass 1 million sales in Korea and Japan’s number one LTE smartphone, according to data from Nikkei BP Consulting. Along with the US and Korea, Japan is a key LTE market, and leading carrier DoCoMo has more than two million LTE customers. 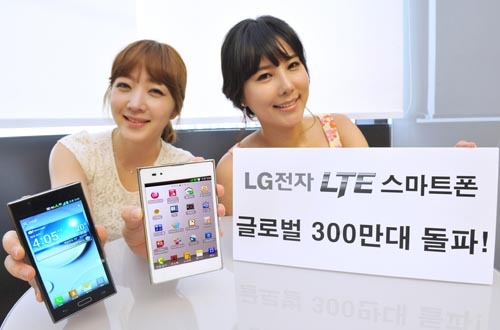 Now, LG is counting on the growth of the 4G technology worldwide. “We’re planning to take the leading position in LTE handsets by showing off innovative products that also focus on improving the user’s experience like the Optimus LTE 2 unveiled in Korea,” LG’s mobile chief Park Jong-seok said. Worldwide shipments of 4G smartphones and tablets are tipped to reach 61 million this year, according to a recent ABI Research report, though there are issues. The analyst firm says that “the lion’s share of the market is backing LTE [over WiMAX]” but it believes that mainstream adoption outside of already strong markets is at least two years away, due to price and consumer awareness. A number of other firms are among those tapping into the nascent LTE space, starting with Apple which is being tipped to launch a new LTE-compatible iPhone before the end of the year, following the introduction of an LTE-compatible iPad. Fellow Asian manufacturers HTC and Samsung both have new much-heralded LTE devices slated to arrive soon. The HTC Evo 4G LTE is set to launch in the US imminently — following a delay at customs — while the LTE Samsung Galaxy S III will be available in Canada as well as the US in due course. These devices are likely to provide fierce competition for LG and hog the limelight and the attention of consumers that are in the market for an LTE device. LG remains a niche player in the global mobile space as recent smartphone industry data from Strategy Analytics reveals. Samsung ranks top (with a 30.6 percent of quarterly shipments), ahead of Apple (24.1 percent) and Nokia (8.2 million), with LG devices accounting for just 3.7 percent of shipments during the first quarter of 2012.